Caroline Carleton was a 19th century, English-born poet who emigrated to South Australia. She is famous for the words of Song of Australia which was adopted in South Australian schools and other places as a patriotic song. In 1977 it made a shortlist of four to select a National Song for Australia. She was born Caroline Baynes on the 6th October 1811 in a place called Bonnar’s Hall, in Middlesex. She was the daughter of a bookseller and was clearly a very intelligent young woman. She could converse in Italian and French and had an excellent knowledge of Latin. Other talents included playing both harp and pianoforte. She waited until reaching the age of 25 before marrying when she met a Guy’s Hospital medical student with noble connections to the Earls of Dorchester. The couple, by now with two children, decided to emigrate to South Australia three years after their marriage. Tragedy struck on this arduous journey though, with both children dying and being buried at sea. The ship eventually docked at Glenelg in September 1839. They had a reasonably prosperous start to their new life and had two more children. 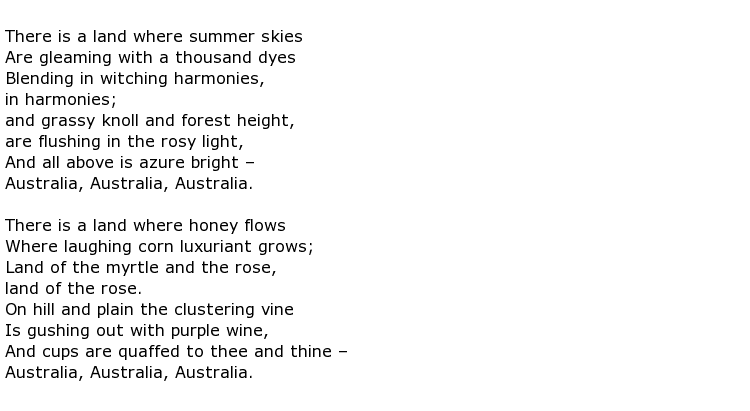 Alongside helping her husband in his various business ventures, Caroline wrote poetry and, in 1859, she penned Song of Australia. A competition had been devised by the Gawler Town Institute for a poem that could be set to music and become a patriotic song to be sung all over the State. She submitted her entry anonymously using the pseudonym “Nil Desperandum” and she won the first prize of ten guineas. In today’s terms that amount would equate to several thousand dollars. Caroline faced financial ruin on the death of her husband in 1861 as she had no income to speak of. A possible remedy was to found a girls’ school but she struggled to make a go of it. She moved her enterprise to different locations over the next ten years before finally moving to the larger city of Wallaroo which was where her daughter Amy lived. This was sometime during 1871 and she found herself travelling between Adelaide and the so-called “copper triangle” of Moonta, Kadina and Wallaroo. A major figure in the mining industry called William Austin Horn, who was also patron of the arts and sciences, admired her poetry and it is believed that he gave Caroline the use of “Matta House”, near Kadina, while on her travels.